This is obviously not normal wear and tear. Guess what caused this? Major expenses related to general maintenance and repair belong to the homeowner, unless caused by the gross negligence of a tenant. Substantial damage caused by the tenant are the responsibility of the tenant. It's for this reason that a landlord in New Jersey is allowed to collect a security deposit from a tenant. There are a number of laws in place to protect the tenant, but the security deposit is intended to protect the landlord. The security deposit is not meant to provide landlord recovery for damage that is considered normal wear and tear. eHow has some nice coverage on your rights by law. As you walk through your living room you are diminishing the life of your carpet with each footstep. As a dwelling gets lived in, its inhabitants are expected to cause some degree of natural erosion. A carpet has a finite life span. Walls cannot be expected to maintain the fresh coat shininess. Faucets may occasionally leak. Drains and septic systems will eventually need to be cleaned out. Harsh winters may cause natural erosion or damage to different parts of the house. Tile grout will eventually diminish and cause loose tiles. It's part of maintaining a home and is considered normal wear and tear in New Jersey. In New Jersey a landlord is allowed to collect a security deposit from a tenant for 1 to 1 1/2 month's rent. This money must be placed by the landlord into an interest bearing account. The account details are to be given to the tenant. The landlord has 30 days after the tenant vacates the premises to refund the entire security deposit, plus interest earned. If the full amount of the deposit is not returned, details of the damages for which deductions were made must be provided to the tenant in writing with any money that was not used for repairs. To protect yourself as a tenant document the condition of the apartment before you begin moving your personal effects into the dwelling. Take pictures and make notes. It would be a good idea to scan the images electronically and email them with your notes to yourself. Doing this provides you with a time stamp that will work in your favor if there is a dispute when you move out. When you move out you are advised to be present with the landlord or superintendent for a final inspection. Take pictures and make notes. Have the landlord or superintendent sign a note stating the condition of the premises and any damages. Scan and email this information to yourself to obtain a timestamp. Protect Your Pets! Don't use store carpet cleaning chemicals... Here is why. Diane had a cat that suffered for many years from an over-active thyroid and excessive shedding. Her cats vet could never exactly figure out what caused her condition. She was an indoor cat, so there was no way she would have picked up something from the neighborhood. It never occurred to Diane that the source of her problem could be right in her own house. I read about a study done by the U.S. Centers for Disease Control and Prevention (CDC) and the non-profit Environmental Working Group (EWG). Researchers found that pet cats and dogs are being contaminated with even higher levels of the same synthetic industrial chemicals that have been found in people. The findings gave Diane another reason to switch to steam carpet cleaning. The research results were sobering. All 20 dogs and 40 cats studied were contaminated with 48 of 70 industrial chemicals tested. Average levels of many chemicals were substantially higher in pets than is typical for people, with 2.4 times higher levels of stain-and grease-proof coatings (perfluorochemicals) in dogs, 23 times more fire retardants (PBDEs) in cats, and more than 5 times the amounts of mercury, compared to average levels in people found in other studies conducted by the CDC and EWG. When you stop and think about it, it makes unfortunate sense. Our pets spend all of their time crawling around the floor or laying on the rugs and furniture, exposing them every day to any chemicals we use. She hated to think that the solvent she was using to clean up spilled wine, were being inhaled by her pets, or rubbing off on their paws, which they would then lick. Diane actually had two cats, plus a dog. She says, "I didn’t want any of them endangered." However, not only were these cleansers bad for her beloved animals. They were bad for her and her children, too. "We spent a lot of time on the floor when our kids were babies, toddlers, and pre-teens. They were being exposed to the same chemicals that the pets were." Here’s another worrisome impact from these chemical exposures: They stick around. Many of the toxic ingredients used in common industrial and household cleansers have a tendency to concentrate in the body, creating what is called a “body burden” of chemicals that can combine for negative effect. Pets, with their compressed lifespans, develop and age seven or more times faster than people do. As a result, pets can develop health problems in response to these chemical exposures much more rapidly. Health problems in pets span high rates of cancer in dogs and skyrocketing incidence of hyperthyroidism in cats. Genetic changes can’t explain the increases in certain health problems among pets, leaving scientists to believe that chemical exposures play a significant role. "I switched to steam cleaning." Steam cleaning relies on steaming hot water to penetrate dirt and work away grime, without the need for heavy chemicals usage. Leaving the bare minimum of chemical residue behind. How do you keep your carpets clean without exposing your pets to toxic chemicals? We’d love to hear your tips! Leave them in the comments below or email us! We are happy to answer questions prior to making an appointment for your service over the phone. Contact us today to speak with a professional carpet cleaning technician about your specific needs. Learn everything you need to know about carpet and upholstery cleaning by turning to Foggs Carpet Cleaning in South New Jersey. But here are a list of frequently asked questions. Typically 2-6 hours depending on the humidity inside and outside your home. If it is humid then putting the AC on will be a must. If you have ceiling fans or any kind of fans at all that will help too. Air flow is a must. If the weather is cool, not humid and breezy outside, then you can open windows. In the winter the regular heater and fan will dry out the carpets because typically it is less humid in the winter. When can I walk on the carpets? If you have a clean pair of slippers or shoes you can walk on the carpet right away. However, if you have asked us to apply a protector on the carpets such as Scotchgard then we highly recommend that you don’t walk on them until dry. Use all the drying suggestions above to help this along. Some customers go out for a while shopping or have lunch or dinner. Will all my stains be removed? Most dark stains are from food or beverages and will come out with the cleaning process. However, if the stains have a color like red, yellow, blue, and green then they are mostly dyes. These may be removed however, this is a different process and there is an extra charge. What are the black lines around the edges of my carpet? These are called filtration lines. All houses breathe. There is a small space between the floor and the wall that allows the house to breath. This however also allows dust and dirt particles to accumulate along the walls. Before installation of new carpet some have caulked this area along the floor/wall and have eliminated a lot of the dark lines. We will work on them with our cleaners and they may lighten but this takes extra time and there is additional charge for it. What time will you show up? We give our customers a 2 hour window. For example between 10-12 am. This means that we will arrive any time during that time period. Because this is a service work it is impossible to know for sure the exact time we will finish the cleaning job before your appointment. If you prefer you can ask for the first customer of the day which is typically 8 -9 in the morning. You may have to wait to get this appointment since it is the most popular time. Yes, we try to call the evening before so that if there are any problems or changes in the schedule will can let our customers know what to expect. If you don’t hear from us then please feel free to call us and make sure of your appointment time. We use professional products that are industry recognized by CleanTrust or the IICRC organization which sets the standard for all certified firms. We never use products that some make up in their kitchen sink. We also can use products for those with allergy problems. Just be sure to mention this before we come. What is the best method to clean my carpets? The major carpet manufacturers like Shaw Industries or DuPont which has developed the fibers recommend steam cleaning or hot water extraction. This is the method we use. We have also found through the I.I.C.R.C. organization seminars we have taken that the hotter we can get the water the better it cleans. Our machine heats the water between 220-240 degrees. This heat does a better job and there is no residue left on the carpet to attract new dirt because we don’t have to use as much detergent as some carpet cleaners. Do you offer carpet and upholstery protection? Yes we do. We will apply this product after our cleaning and it is very important to let the product dry completely before using the carpet or furniture because you will walk it off. We will move regular sized sofas, chairs, love seats, end tables, coffee tables. We just ask that you move any knick knacks or pictures on the tables so that we don’t accidentally bump into them. If you prefer that we don’t move anything and only clean the walkways of the rooms, we will adjust our price down. We don’t move TV’s and their stands, pianos, china closets, hutches. In the bedrooms we will move all the small items but not typically the bureaus, chest of drawers and beds. These items can be moved if you would like but all the items on them have to be removed and the bed has to be stripped down. There is a small extra charge for this because of the time factor. Is there Sales Tax on my carpet cleaning? Yes, there is and it will show on your bill. Please include it in your payment. We have to pay the State the tax and so do you. My carpet rippled after the cleaning? Did the cleaning cause this? On rare occasions we have seen carpets that were loosely installed develop additional ripples when cleaned. However, the carpets when dry will return to the way they were before the cleaning. If you have ripples in the carpet before we come to clean we highly suggest that the carpet be stretched by a carpet installer using a power stretcher. We may be able to recommend someone if you don’t have an installer that you use. We include regular deodorizer in all of our cleaning. It leaves a nice fresh smell and is not overpowering. However, if you need extra deodorizer because of cat or dog smells, then we can do that at an additional cost. What should I do before the technicians arrive? You can vacuum if you haven’t done so in the last few days, pick up any small stuff on the floors and on tables that will be moved. Also, please leave us a spot in the driveway close to the house so we can bring our equipment in. What can you do about pet stains? These have to be pretreated before we can do the regular cleaning. 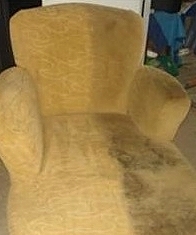 If you have a good idea where the stains are then point them out and we can effectively treat them. If not then let us know. We have an instrument that will detect them. If the animal has urinated in the same area multiple times, there is most likely urine in the padding and even the floor. Regular cleaning and even spot treatment will not get all of it. The stain may reappear after it has dried. This is not because we didn’t clean it. It is because during the drying process the urine that is below wicks up into the carpet. We can treat and clean this area again but because this is an extra trip there will be another small charge. Will my pet stop going in the same spot? Most likely not. Unfortunately, animals get set into a habit and it is very hard to break them of it. The room may have to gated off in order to stop this. Also, animals have a keen sense of smell and they can smell the urine even if we have cleaned it multiple times. So we can make no guarantee of total urine removal. How do you price carpet cleaning/ tile cleaning? Estimates are always free. We feel that the fairest way is to measure the carpet to be cleaned. For example: Some companies say they will clean 4 rooms for a set price but when you get the details, you may find out that they consider a small hallway or foyer as one of the rooms. So in reality you aren’t getting as much cleaned for your money. Also in order to offer these specials they have to clean your carpet very quickly and will only go over the carpet one time. We on the other hand will clean the more soiled areas as much as is needed and will not cut any corners in our cleaning process. Do you Clean Tile or Area Rugs? Yes, we can clean the tile on the same day as the carpets. We use the same cleaning truck mounted machine but we hook up a different cleaning wand for tile. You will be surprised at how clean this will get your tile and grout. Area rugs can be cleaned at your home IF they sit on ceramic tile or some other hard surface and NOT wood. Area rugs sitting on wood floor are best cleaned in our shop. We will take them with us, clean them, work on the fringes (if they have any) and then deliver the rugs back to you. If you wish to store the rugs then we will paper wrap them for you. We can also store the rug for you if you prefer. Please call us for prices on the rug cleaning and storage. Do you do any rug repairs? Yes, we can have your rugs re-fringed, bound or repaired. Please call for prices for this service. Yes, we will try our best to do the very best work for you. All our technicians are trained and certified with IICRC. This means we have attended seminars and classes and learned the standards of carpet cleaning set out by IICRC an international organization that sets these standards. Steve Fogg is a Master Technician; Sharon Fogg is a Journeyman Technician. Eric Fogg and James Rankin are Cleaning Technicians. If you would like to go to IICRC.org you can get much more information under the Consumer tab. HAVE A QUESTION NOT MENTIONED HERE? WRITE US OR LEAVE A COMMENT BELOW AND LET US KNOW. WE WILL POST IT ON OUR WEBSITE. Email us or call us today at 609-645-1799 with more questions or concerns regarding our professional carpet cleaning services. There are several things to consider when wondering how often you should have your carpets professionally cleaned. The time frames mentioned below are suggestions based on keeping your carpet looking it’s best for the longest time possible. To get the most life out of your carpet, you’ll want to have it cleaned BEFORE it starts to show signs of wear. Deep-down soil, that settles to the base of your carpet fibers can cause your carpet to break-down prematurely, shortening it’s lifespan. Think of it as preventative maintenance – you change the oil in your car before the engine begins to make knocking noises, right? Take the same good care of your carpet and it will last longer and look better. Do you have a carpet warranty that you want to keep intact? If yes, check your warranty paperwork. Most carpet manufactures require that you have a professional steam cleaning (technically named a hot water extraction) once a year. If you don’t have a warranty that you’re concerned about, then you’ll want to consider the following variables when questioning how often you should have your carpet cleaned. They can do a number on your carpets. A large family is wonderful, often providing a warm and inviting home. More people simply means increased carpet traffic. With children in the home, the suggested amount of time between professional carpet cleaning can range from 6 months to 1 year. On average, about every 9 months it’s a good idea to have your carpet professionally cleaned. We all love our pets! Unfortunately with pets in the home, you should be having your carpet professionally cleaned every 6 to 12 months. More frequently if your pet has bladder/urine issues. The reason for more frequent cleanings is due to the fact that your pets drop dander, hair, and dust on your carpet fibers. Frequent vacuuming can extend the time needed between professional cleanings, but frequent vacuuming can mean three times a week or more - and who has time for that? We can help with pet odors and stains! If you live alone or with a partner and you are gentle with your carpet, it’s not un-common to go up to 2 years between professional cleanings. You’ll have to judge the amount and kind of traffic that your carpet gets to determine what is best for your home. To determine how often you should have your carpet professionally cleaned, consider the traffic your floors get and who is providing the traffic. The greater average varies from home to home; from as often as every six months to more than two years. Consider your standards of clean, foot (or paw) traffic, and your budget to help you determine how often you should have your carpet professionally cleaned.